It’s best to dry quilts flat on carpet protected by a sheet. Photo by Barb Gorges. A wet quilt is a delicate thing. The larger it is, the heavier it is and the more carefully it must be treated to make sure the weight doesn’t break quilting stitches. However, a heavily machine-quilted quilt is probably stronger than one with widely-spaced or hand-quilted lines of stitching. It’s best to air dry quilts flat. I lay a clean sheet over polyester or nylon carpet and then spread the quilt, squaring it up, blocking it. Here in Wyoming, even quilts with cotton batting are dry in a few hours. If necessary, set up a fan. But if I use the “max extract” option on my washing machine, the quilt is so compressed by the end that I opt to toss it in the dryer on very low heat or just air for 10 minutes to loosen it up and make it easier to spread. Some quilters, before the quilt on the floor is completely dry, will pop it in the dryer to fluff it. If you think any of the fabrics might bleed (you didn’t make the quilt or you didn’t take steps in Part 4 to check fabric washability), forget air drying—put the quilt in the dryer immediately, before the dyes have a chance to migrate. One reason we avoid using the dryer is to lessen wear and tear on the quilt, but I think a stain from a bleeding fabric is worse. Line drying is very hard on a quilt, especially if it’s large and clothespinned. Stitching may break. However, a hard-used crib quilt will be just fine on a line. 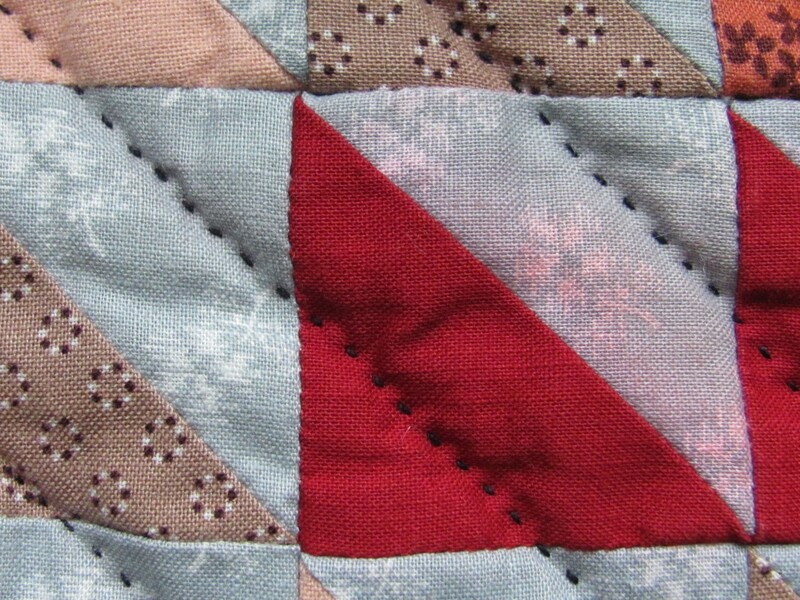 For other utility quilts, if you have multiple parallel clotheslines, you could spread a quilt out over all of them. Be sure to wash the lines or cover them with a sheet first. And maybe put a sheet over the quilt to protect it from passing birds. The first 10 parts of this series are available on this website. Two navy blue fabrics reacted differently to ultraviolet light from sunlight and artificial light over the last 20 years while on display only about one month per year. Photo by Barb Gorges. 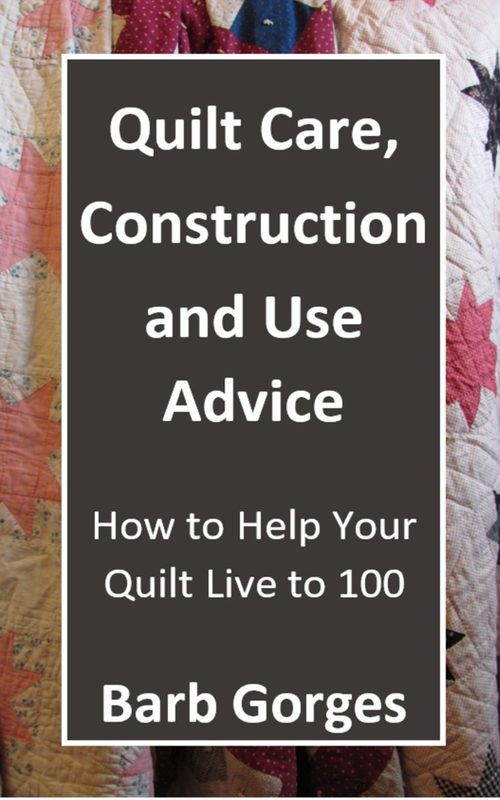 *Scroll down to see the first five parts of this series or click on the tab above for general quilt care information. Spreading your quilts on beds is only one way to display them. Many of us drape quilts over other furniture (avoiding unsealed wood), fold and stack them on open shelves or hang them on the wall. Quilts on display don’t get the same rough treatment as quilts used for warmth. Instead, light is the biggest problem. If you’ve replaced your windows with energy efficient, low e (low-emissivity) glass, you’ve somewhat reduced the fading problem caused by the ultraviolet wavelength in sunlight. Artificial lighting also has UV rays. Fluorescent lighting is the worst. Look for products that can filter UV light. It is inevitable that quilts will fade if they spend any time with enough light to be seen, and that is part of the charm of antique quilts. At least make sure your quilt doesn’t fade unevenly. 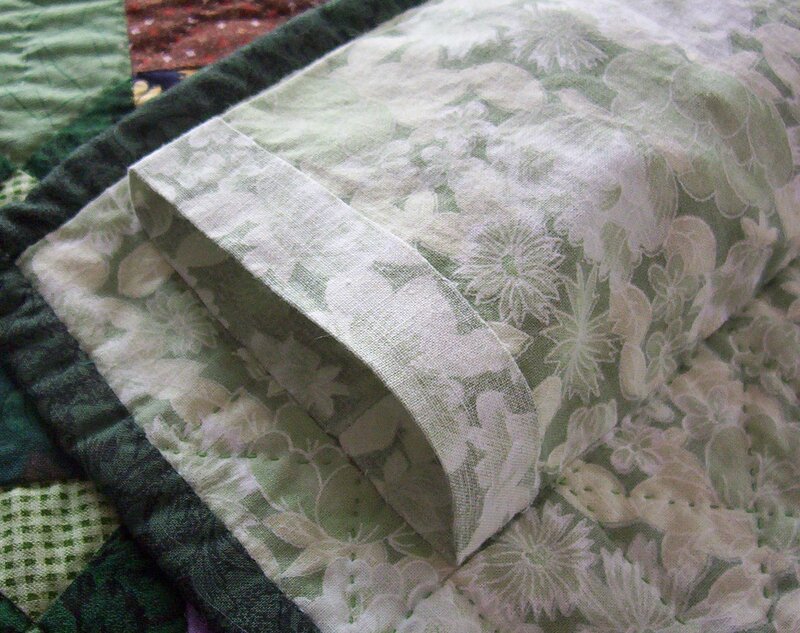 A quilt faded along an exposed fold looks worse than a quilt with overall fading. Refold those quilts on display often. Flip the quilt around so the same corner isn’t illuminated by the same sunbeam each day. One recommendation, from www.museumtextiles.com, is to rotate quilts on display every 6 months. In a bright location, I think you should rotate them even more often. This is the justification you need to make lots of quilts—at least one for each season for each display location! After light, dirt is the other issue for quilts on display: dust, pollution, household cleaning product fumes, pet hair, wood smoke, tobacco smoke, greasy cooking vapors. You may want to wash a quilt (a future topic) that has been on display for a while before rotating it into storage. Next time I’ll discuss how to safely hang a quilt.